The British Academy Siem Reap is a new international school which follows the British National Curriculum. We are about to enter our second year, when we will have approximately 20 children on roll, aged 2 – 11, of Cambodian or mixed nationality. As we now need to divide our pupils into two classes, a kindergarten and a primary, and will also be introducing Khmer and Mandarin Chinese into our timetable, we intend to make appointments to the following positions. We have a vacancy for a part-time Khmer teacher, who will initially be under contract until 30th June, 2018. Duties will involve teaching two classes one hour in the afternoon each twice a week. This will mean a minimum of 16 hours a month, except when school holidays intervene. The groups will be separated by ability rather than age, and, while every child at present on roll is at least partly Cambodian, the successful candidate can expect to find a significant difference between the two in terms of literacy and will need to adjust their approach accordingly. Preparation of materials and resources will be in consultation with the school management. 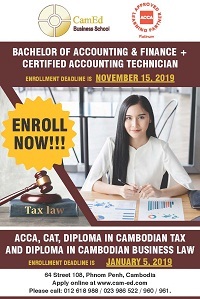 Candidates should have a degree in any subject from a Cambodian university, and a teaching qualification or at least some experience in the field of children’s education. Salary will be negotiable, but $6 an hour will be the minimum offered. A probationary period must be served. To apply for any of these positions, please e-mail an updated c.v. and a letter outlining your interest and suitability to britacadsr@gmail.com, attention of the Principal. Please e-mail, or call 017 765942, 096 4833822 or 097 3780376 if you would like further information. We are on Facebook as British Academy Siem Reap. The closing date for applications will be Friday, 8th September, 2017, but we reserve the right to make appointments earlier if possible.